Be pretty and peppy in pink when you wear the Pink Tinsel Wig For Adults! Attend a fun sporting event and wear this wig while you cheer your team on from the stands. Put this outrageous wig on with an ‘80s costume or be a visitor from another planet this Halloween. 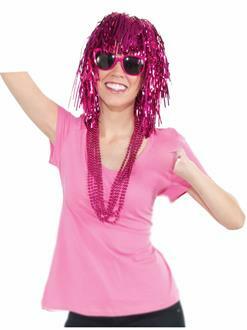 You'll be thrilled to have any excuse to wear this pink tinsel wig!